Sweet potato skin colors come in various shades of creamy white, yellow-orange, tan, reddish-purple and red. Sweet potato flesh colors come in shades of orange, yellow-orange, white, purple and red. 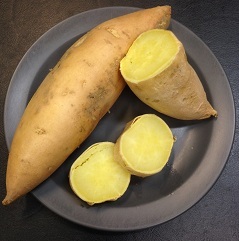 Below are descriptions for some sweet potato - yam varieties found in North America. Link to a chart that shows skin colors and flesh colors for over 100 popular sweet potato varieties. Sweet potatoes come in many different shapes and sizes too! Nemagold, Centennial, Southern Delite, Hernandez, Regal, Bush, Travis, Excel, Vardaman. Star Leaf (known generically as Boniato), White Delight, Nancy Hall, Sumor, Picadita, Campeon. Most of the sweet potatoes produced in the U.S. are either Beauregardor Jewell (see descriptions of these and some other popular sweetpotato varieties in chart below). Varieties of sweet potatoes discovered by a friend shopping a Philadelphia (Chestnut Hill) farmers' market October 2013. Thanks Charlotte B.! Here's a picture of White Hamon sweet potatoes at a local market. I was delighted to discover these White Hamon sweet potatoes because rarely do city food markets provide varieties other than Jewel or Beauregard. I bought several and made a root vegetable dish with them. The recipe, which includes sweet potatoes, parsnips, rutabagas, sweet onions, carrots, white radishes, white beets and turnips, in varying combinations, is featured on this site's recipe page. I've included a photo of the sauteed root vegetables, which are delicious roasted too. The Duck Creek Farms' website provides descriptions of many of the varieties of sweet potatoes that they usually provide for shipment from late spring till early summer. See some of Duck Creek Farms' sweet potato varieties that were available in 2015. Email them at duckcreekfarms@aol.com for more information about retail sales and ordering availability in 2016. 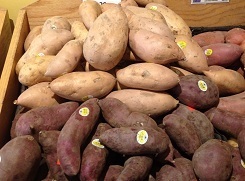 The Wayne E. Bailey Produce Company's website provides some more background, description and pictures of other sweet potato varieties including several Asian ones. What is Your Favorite Variety of Sweet Potato? Which variety of sweet potatoes do you like to eat? Share what you like about them! Your submission will appear on a Web page exactly the way you enter it here. You can wrap a word in square brackets to make it appear bold. For example [my favorite sweet potato] would show as my favorite sweet potato on the Web page containing your feedback. Dark red orange flesh oozing syrup when baked in the skin. Lovely unctuous sweet flesh when seasoned with a pat of butter and salt and pepper. Carolina Ruby has the perfect balance of sweetness; it's early maturing, and attractive with lots of vitamin A material. Very little sugar and is somewhat like a regular potato. This potato has a natural sweetness and needs only spices and butter. Very sweet, bright orange color, tastes delicious. I prefer a small, smooth potato for baking. But a larger one is good for candying. When baked it (Bonita) is very sweet without the fibers of orange sweet potatoes. Just the best, and a super high energy food for enhanced strength, stamina and also mood improvement. Hannah sweeet potatoes make a good pie. taste good, they are healthy and easy to prepare...because I just steam them with skins on....after they cool they are easy to peel and taste great. The taste of Japanese sweet potatoes is sweet and delicious and full of nutrients and it's so easy to cook and easy to bake. They have a nice texture, are sweeter than any other sweet potato. Mashed with vanilla and coconut milk, they don't even need sugar added! This variety has a sweet taste! It, O'Henry Sweet Potato, is awesomely tasty!! This sweet potato has an outstanding taste. I like them all because of their colors, and the origins they have. I love this white flesh sweet potato. They (O Henry) bake dryer than most varieties; butter and brown sugar are absorbed nicely into the flesh.